JBF Rockford is excited to partner with several local charities. All unsold items that consignors choose to donate are given to these charities. Hi, my name is Gloria. I have been married to my husband Josh for 20 years, and we have 2 children - Jackson (11) and Reagan (9). 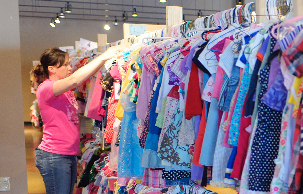 I want to help other moms to not only make money on the investment they have made in their children's clothes and toys, but also to find good bargains on anything they might need for their growing families.